Three Points Center’s therapeutic model helps adopted youth develop their emotional regulation capacity, rebuild familial relationships and create alternative memories. These children have experienced trauma in the form of abuse or neglect, (physical, sexual or emotional). In addition, many have experienced poor prenatal-care from their mother’s drug use during pregnancy. This pre-natal neglect has typically affected the child’s emotional development; setting them up for a series of highly charged events at home, in school and in other social settings. These events cause the child to create a negative belief about themselves, their world and their future. The neglect has also created a fear of abandonment, and lack of attachment, which blocks normal relationship development. These children tend to see themselves as “throw-aways” who are destined to fail. They see their adoption as a personal flaw rather than a gift. This perspective creates a search for purpose and validation; a search that makes them vulnerable to predators. Why Horses and Why Mustangs? A key therapeutic strategy of Three Points Center is the use of equine therapy. Equine therapy has become known as an effective avenue to reach people’s emotional areas they have guarded or didn’t realize were blocked from them, due to their past. 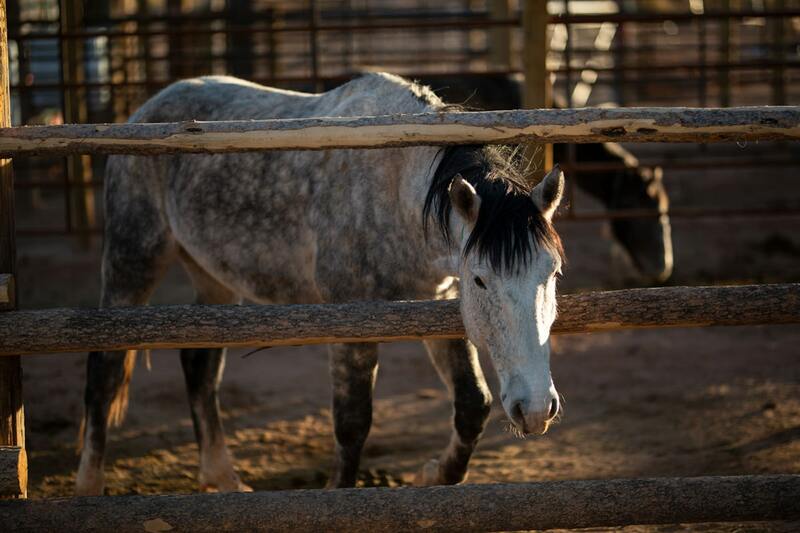 Equine therapy occurs in many treatment programs across the U.S.
Three Points Center has built its equine program around the North American Wild Mustang in partnership with the Bureau of Land Management (BLM) and the Mustang Heritage Foundation (MHF). Wild mustangs have spent most of their lives untouched by humans and have for centuries, been able to hone their ability to read their environment in order to survive. When humans enter their environment, mustangs sense if they are calm and balanced, or troubled and on-edge. They sense and react to the emotional presentation as well as the inner feelings that may not outwardly be demonstrated. Using the wild mustang as a partner in the therapeutic process, raises the bar of the equine therapy experience. At the center, youth learn to train wild mustangs and prepare them for public adoption. The process of gentling these wild animals adds value to both the horse and the youth. The process creates many positive opportunities and memories which the youth can draw upon as proof that they can be successful and they are stronger and better than they believed. The mustang gentling process builds on the power of the “alternative memory”. Alternative memories are new memories that are created by positive self-awareness experiences that build up and out-weigh the power of the old negative memories. An alternative memory does not replace a past experience or memory, but rather, it serves as a vehicle to help establish a new foundational belief regarding one’s value and potential for success. #1 Identifying and Coping with Feelings. Horses sense emotions and react accordingly. If someone is angry or aggressive, the horse may become obstinate. When approached by someone who is open and calm, the horse is more likely to respond in kind. Witnessing this can help people see themselves in a more realistic way. #2 Communication Skills. Working with horses, people recognize their conscious and unconscious patterns of interacting with others. Horses do not speak, but they are excellent communicators. Learning to understand horse behavior can help people learn how their behavior impacts others. #3 Setting Boundaries. Without any words at all, horses make clear when someone has crossed their boundaries. Being extremely detached or passive can make it difficult to lead a horse and will deter the horse from complying with a request. #4 Overcoming Fears. Horses are large animals, which can bring up fears, past trauma, and feelings of inadequacy or lack of control. In equine therapy, people learn to tolerate and process these emotions and past experiences. #5 Trust. Horses are soothing, gentle animals. They are straightforward in their interactions without lying or manipulating. They do not judge or blame. When people open themselves up, they grow in their ability to build relationships.